The year has almost come to an end and as the festive season commences most of you are undoubtedly making plans to join your loved ones for the Celebrations. 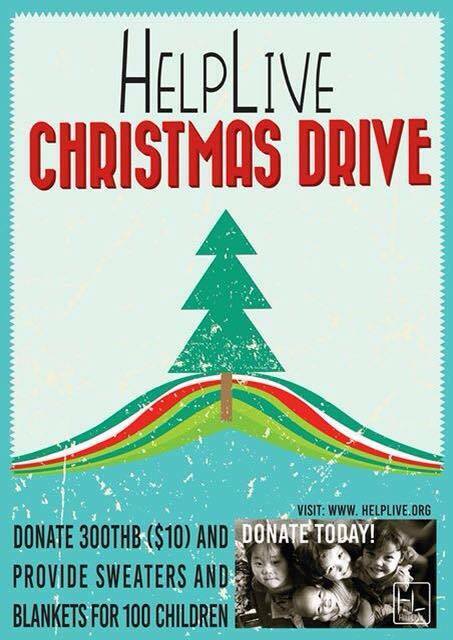 Here at HelpLive Thailand the children are also eagerly looking forward to celebrate Christmas and it is hard to miss the happy smiles on their faces as the day gets closer. As part of a Christmas fund raising we have started an initiative where you can make a donation of 300THB ($10) which will be utilized to provide warm clothes and blankets for the children this winter. It maybe a small donation from your part but it will definitely help keep a child warm. If you wish to make a donation click on the 'Online Donations' post on our homepage. For more information you can write to us at helplivethailand@gmail.com.